January | 2013 | what? bread? not one for the younger members of our families. Mine’s away with cubs this weekend, despite the snow, sleeping inside I should add. I wanted something that was sweet but not chocolate based as I’ve O.D.’d on chocolate flapjacks this week. 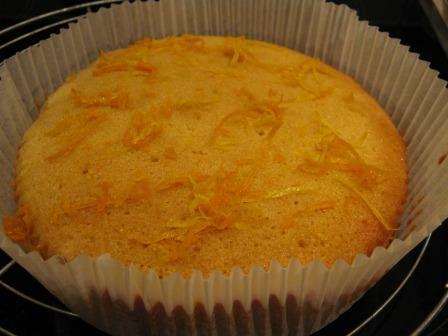 Crunchy Citrus Cake – another one from Pat Ring’s book. 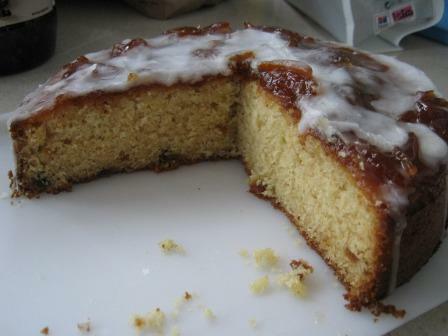 Ingredients – lemon, orange, sunflower oil, caster sugar, eggs, semolina, baking powder, ground almonds, almond extract. Topped with zest and Grand Marnier (although you can choose a mascarpone topping instead). Couldn’t be easier, just weigh and mix with a blender or spoon, and uses sunflower oil which is a good thing in this weather as the butter is just as hard outside the fridge as in it! I did give it 10 minutes longer in the oven than stated in the recipe. My NY resolution for 2013 is not to buy any more cookery books, but to explore further the ones I already have and to revisit older favourite recipes that I may not have made for a while. Now the last bit of slightly stale Panettone and hardened Christmas cake has been eaten I can start 2013 baking. Yipee! Much as I love seasonal baking, I do like making things regularly and I haven’t baked anything except bread since before Christmas Eve. 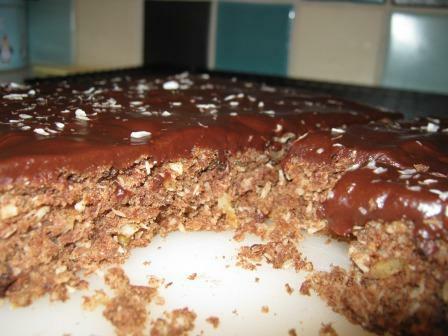 To kick off 2013 today I made Chocolate Coconut Chunks from Pat Ring’s Cake, which was the last cookery book I bought towards the end of 2012. 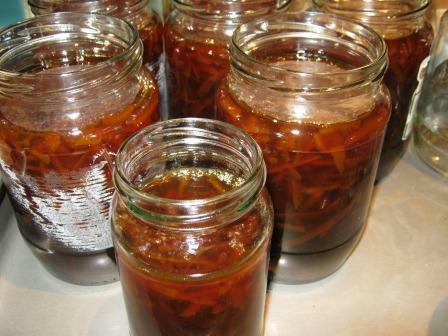 This is an excellent recipe for using up relatively small quantities of a large number of ingredients you may have lurking in your cupboards, plus a bit of butter, an egg and some milk in the topping. 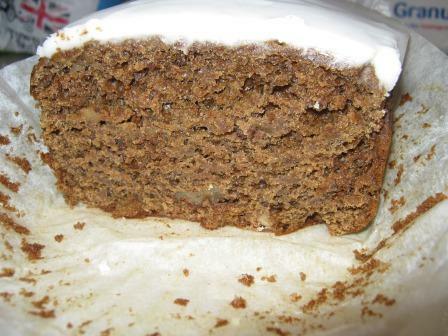 Without giving away quantities, you’ll have to get the book if you want to make this, there is: butter, walnuts, plain flour, baking powder, soft brown sugar, dessicated coconut, cocoa, sultanas, Weetabix (the secret ingredient), egg, vanilla extract. 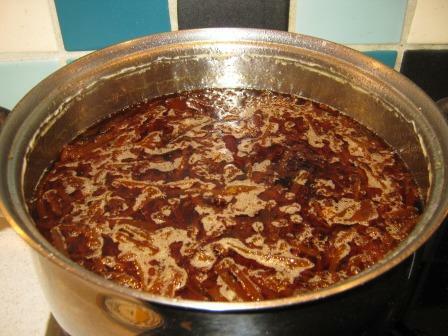 The topping is meant to be milk chocolate, butter, milk and icing sugar, sprinkled with more coconut. I didn’t have any milk chocolate (well the child wouldn’t sacrifice some of his bar) so made do with plain (which I generally prefer to Cadbury’s any day). I used an 8 inch square tin to bake it and that was fine, and cut it into 16 pieces. Using MyFitnessPal‘s data I calculated each piece contains about 260 calories. 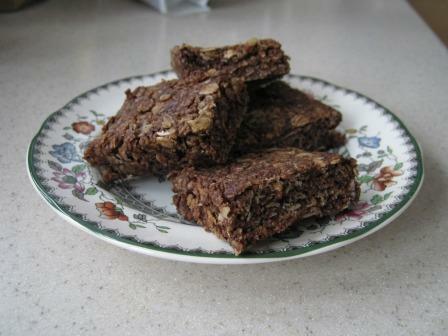 As you can see from the picture, this bake has a slightly chunky texture, a bit like flapjack. The nuts and fruit makes for a treat that you can’t just swallow down without chewing. Yes, I have had cake that you don’t need to chew and there’s a time and place for everything and early in the year when we’re getting over Christmas excess by reducing calories I think you need to chew everything thoroughly and make sure you get every bit of flavour and texture out of your food. We can get to cake you don’t need to chew later in the year!